Hi friends I want to change my language of on screen keyboard installed windows 7 ultimate sp1 and I don’t know how to do it can anyone please tell me how can change it please thank you in advance. 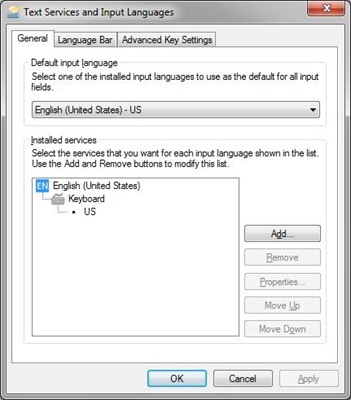 Steps for changing Keyboard Language in Windows 8? Method to change the Keyboard Language from English to Greek on Windows Tablet? Is there any option to change keyboard language in Nokia phone powered by windows? Re: How can I change the language of my on screen keyboard in windows 7? So by this way you can change your computer language. 1) Click on "Start" and type "Language" in the Search Box. 2) Open "Region and Language". 3) Click on "Keyboards and Languages" tab. 4) Click "Add". You can view the list of Languages. and Press "+" to expand it. Click "OK". You can view the list of Selected in the "Text Services and Input Languages". 5) The present Language used by the Keyboard is seen at the right end of the Task bar. You can see "RU", indicates that your Keyboard is using Russia Language. 6) You can use the Left - Alt + Shift to change the Language next by next. step 1: go to start menu and type ' region and language' in the search window and press enter. 2)click it and in the next dialog box click on the KEYBOARD and LANGUAGES tab. 2)a long list of languages will be shown..
You can change your computer language and also on screen keyboard's language by installing softwares which supports different languages and also you can search in the internet for different languages around the world.you should use control panel options to change the language settings of your system. Windows 7 can display characters and other features of a wide range of languages. Support for several languages may be installed on your computer. ​The Windows 7 On-Screen Keyboard is very versatile and loaded with features. To change language support just press Left-Alt+Shift – if the keyboard is configured. Click the START orb and type “language”. The Start menu will include Region and Language. Click it. (Of course you can get there from the Control Panel.) In the next dialog click the Keyboards and Languages tab. ¤Go to Start»»Control Panel»»Language and Region. Or you can click on Start and type "language" in the search bar. This will direct you to the Region and Language window. ¤Click on the Region and Language tab. Click "Add".A drop down menu appears with list of languages. Choose your language and click on + to expand the list,both for language and keyboard. Check in the on on screen keyboard tab box. The keyboard language is successfully altered. 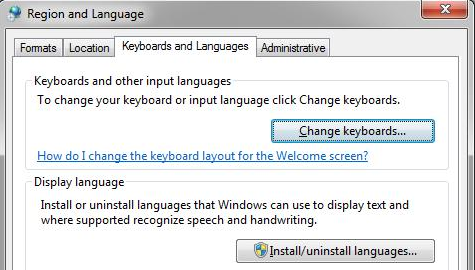 Follow these steps to change the lanuage of on screen keyboard..
1-Click the START menu and type “language”. The Start menu will include Region and Language. 2-Click it. (Of course you can get there from the Control Panel.) In the next dialog click the Keyboards and Languages tab. 3-Click Add…A long list of languages will be shown. 4-Find the language you wish to install. Click on the + in front of the entry to expand the list. Similarly expand Keyboard. 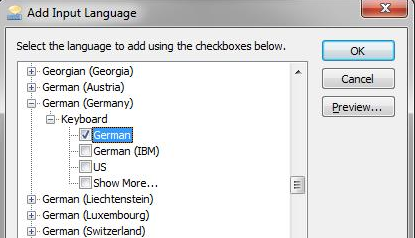 5-Select the keyboard language from the last options, make sure the box is checked. Then click OK. You can now see the installed languages in the Text Services and Input Languages window. 1.Click START orb and type LANGUAGE. 2.The start menu will include REGION AND LANGUAGE.Click it. 3.In the next dialog box click KEYBOARDS AND LANGUAGE tab. 5.A long list of languages will be shown. Find the language you wish to install. Click on the +in front of the entry to expand the list. 6.Similarly expand Keyboard. Select the keyboard language from the last options, make sure the box is checked. 7.Then click OK. You can now see the installed languages in the Text Services and Input Languages window. 1.click the start and type language in the search box. 2.in that select region and language.click it(ofcourse you can get there from the control panel). 3.in the next dilouge click the keyboards and languages tab. 4.then click add.....a long list of languages will be appeared,find the language you wish to use for on screen keyboard. 5.then click add button to after choosing your desired language. 6. similarly expand the keyboard,select the keyboard language from the last options.make sure the box is checked.then click ok.
Click the START orb and type “language”. The Start menu will include Region and Language. Click it. In the next dialog click the Keyboards and Languages tab. A long list of languages will be shown. Find the language you wish to install. Click on the + in front of the entry to expand the list. Similarly expand Keyboard. Select the keyboard language from the last options, make sure the box is checked. You can now see the installed languages in the Text Services and Input Languages window. To change the language on keyboard in windows7 pc following these steps. 2.Right click on control panel. 3.click on region and language. 4.click on keyboards and languages. 5.here you can change the language on your keyboard. Yeah! I have got your problem and i have the right solution for it with me. 2.Now go to the 'start menu' tab. 3.Then after go to the 'Control panel' tab. 4.Now click on the 'Clock language and region' tab. 5.Now click on the 'Keyboard and languages' tab. 6.Now in this menu you can change the language of your Keyboard. To change the keyboard language just go through the below steps which i will mention and you will find the solution . => Go to the control panel . => Select the " Region and language "
=> Select the " Keyboard and languages "
=> Click on Add button and you will get the list of languages . => Select any language and press ok and then click on apply button . => Your language changed successfully . 1.Firstly you go to the start menu and you open the 'Control Panel'. 2.Then you click on the option 'Regional and Language' option. 3.Then you click on the option 'Change Keyboard'. 4.There you click on the 'Language' tab. 5.Then you select the language which you want. The following is the procedure for solving the problem of changing the language of your screen keyboard in windows 7. Now press the opiton of 'clock,language and region'. There you need to press the 'keyboard and languages' option. After that for your keyboard,the language is to be selected which you want according to your choice. Then press the OK option. 1. First Press the following keys Left Alt+Shift to open your language setting page. 2.Click on START and type Language. 3. The Start menu will include Region and Language. 5. In the next dialog box click the keyboard and languages tab. 8. A long list of languages will be shown. Find the language that you wish to install. 9. Click on + in front on entry to expand the list, similarly expand the keyboard, select the keyboard language from the last options, make sure the box is checked. 10. click OK and now you can see the installed languages in the TEXT SERVICES and INPUT LANGUAGES window. select the language that you want . and save the changes . How to change the start up screen colour or Windows 8? Keyboard Alphabets are being interchangeably entered after installing Windows 7 on my PC?